My library system has one central location and 9 branches. 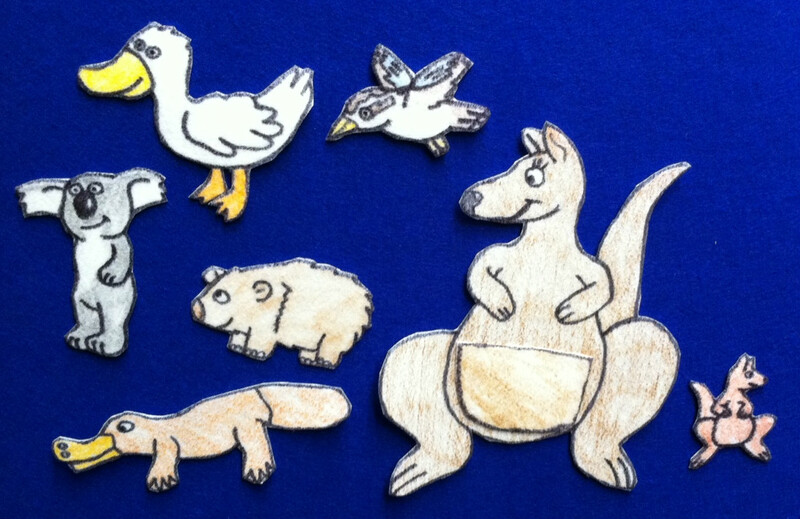 To make storytime programming easier for all involved, we use storyboxes. These are “storytimes in a box”. They contain everything a storyteller would need for a successful storytime including books, videos, fingerplays and crafts. Ideally, there should be enough variety that the box can be used for infants/toddlers, preschoolers, and lower elementary ages. Here’s the latest storybox I put together for rotation. I’m Lost! Find Your Way with These Fun Stories! For this one, I just use my Little Mouse, Little Mouse flannelboard, and change the story a bit. I asked my friend Little Mouse to come visit me. But I have been waiting now for a long time and he still isn’t here! I think Little Mouse ended up at the wrong house! Can you help me find him? Little Mouse, Little Mouse, are you in the _(color)_ house? Pattern and Story taken from: Briggs, Diane. Preschool Favorites: 35 Storytimes Kids Love. American Library Association, 2007. Pg 87. Place the joey on the flannelboard and add each character on cue according to the poem. 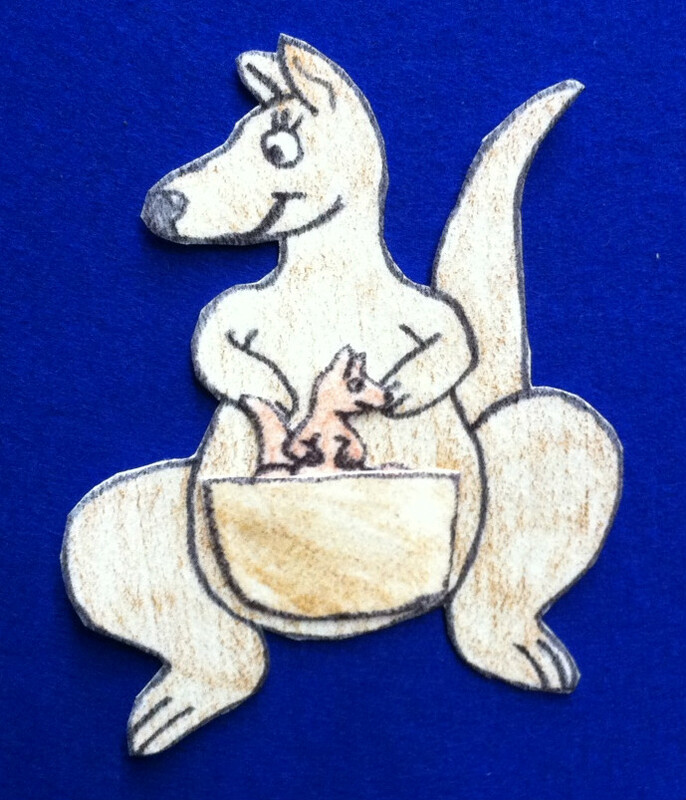 On “ran to his mommy with glee,” place the mother kangaroo on the board and put the joey in her pouch. The pouch is glued so it is loose and open at the top to insert the joey into. Whose name was Sonny Jim. His mommy seemed to be missing. Oh what a fix he was in! As she was waddling down the road. If his mommy he could find. He just didn’t know what to do. Said, “Sonny Jim, dry up your tear drops. And ran to his mommy with glee. And they jumped away happily. From: MacMillan, Kathy. A Box Full of Tales: Easy Ways to Share Library Resources through Story Boxes. American Library Association. 2008. pg 113. 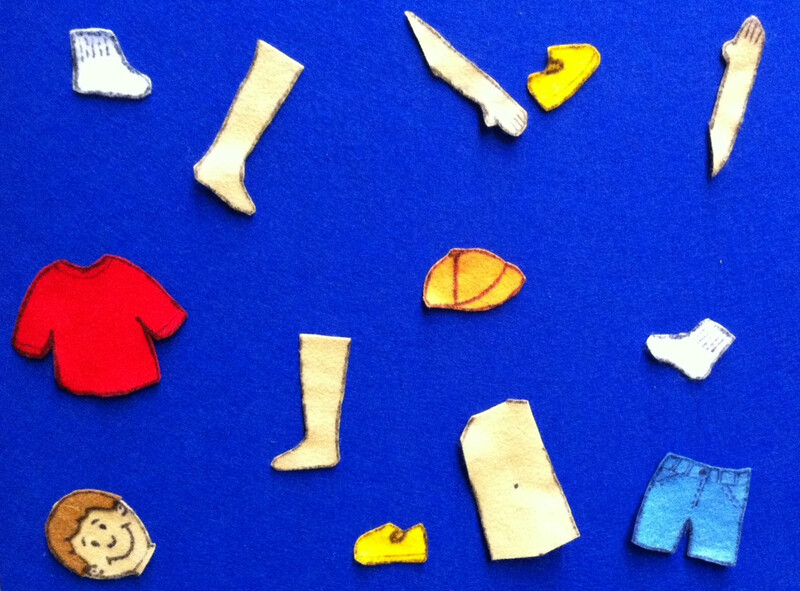 Before storytime, hide these pieces around your storytime area. You know, my friend Larry was always losing things. He would leave his socks lying outside on the lawn, or his hat in the car. He could never find anything! One day, his mom said to him, “Larry, if you’re not careful, you’re going to lose your whole self one of these days, piece by piece.” And do you know what happened? HE DID! 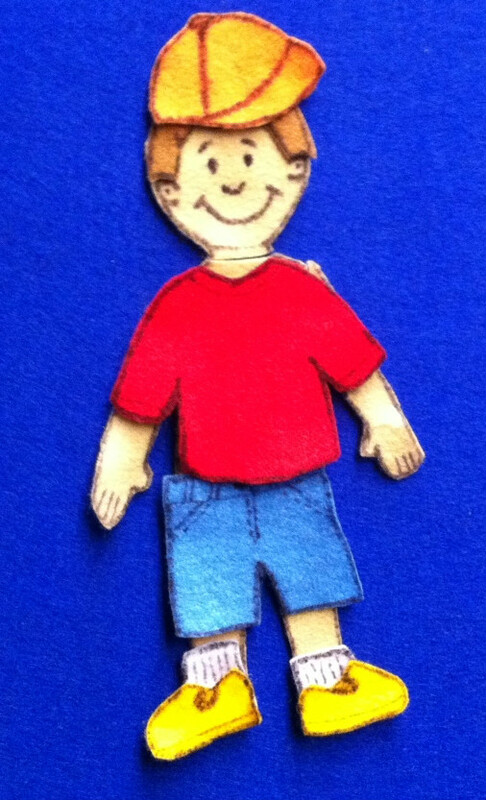 Can you help me find him and put him back together? Have children search the storytime room until all the pieces are found. Who has Larry’s head? Can you bring it up to the flannelboard? Look at that! Silly Larry is all in one pieces again. Thanks for your help! I bet Larry will be a lot more careful about losing things from now on. Start with the pieces in a bag. 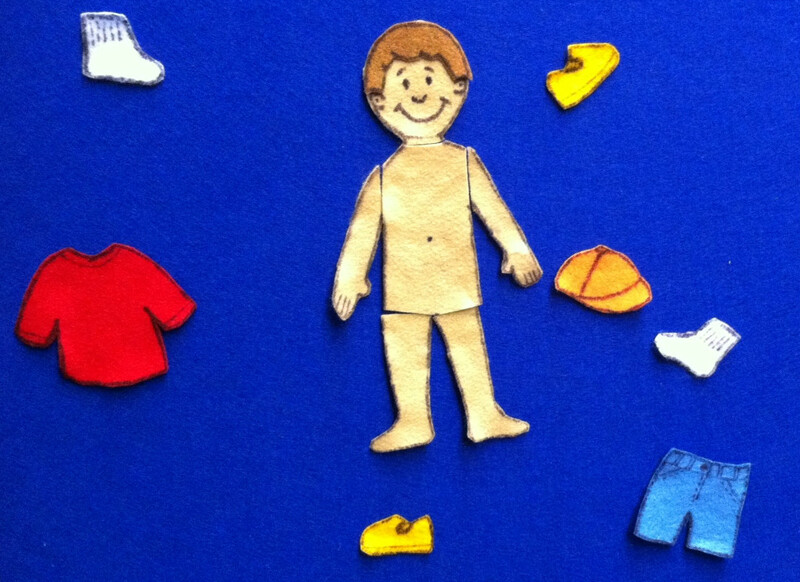 Take the bag around and have children pick out a body part, or piece of clothing. You can also use Larry’s torso in this version if you would like. Who will help us when we’re lost? Who will help us get home, whatever the cost? So if you’re lost, look and see. Who are good friends to you and me? From: MacMillan, Kathy. A Box Full of Tales. American Library Association. 2008. And he or she will help you! …quarter to ten… fold up your map and go to bed! My dog ran away! My dog ran away! Oh, what can I say? My dog ran away! And in a circle like so. And I looked on the floor. But – what’s this> He’s on my head! And doesn’t know what to do. (Hold out hands and shrug shoulders). The mother describes the child’s hair color, clothing, eye color, etc. The police officer walks around the circle and chooses one child he thinks fits the description and brings the lost child back to the mother. That child is the next police officer and the game continues. to where my boo might be. a boo to call his own. to be a gruesome ghost. then you had better give it back. Oh where, oh where, has my little dog gone? Oh where, oh where have my little pets gone? Oh where, oh where can they be? Woof! Bow-wow! Oh, here he comes now! My dog is back home with me. And doesn’t know where to find them. Leave them alone, and they’ll come home. Wagging their tails behind them. your head so high above the ground. 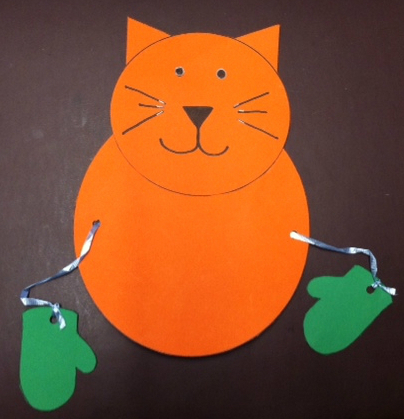 Copy and cut out the cat shape and the mittens. 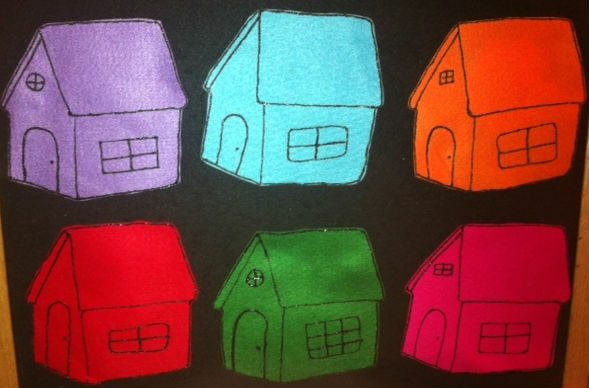 You can do these in different colors, or leave them blank so children can color. Glue the cat head to the body. Line up the mittens with one side of the cat body. Punch a hole through both the mitten and the cat. Repeat on the other side of the cat body. String the ribbon across the back of the cat and have the ends dangle down through the holes on the front of the cat. Tie the ends of the ribbon to each mitten. Now the child can pull the string behind the cat, and have the mittens go from lost (far away from the cat’s body) to found (mittens close to the cat). The mazes I used with this box I just found online. They are no longer available, but any easy maze for kids would be a great activity with this theme. I used Highlights magazine to find some fun Hidden Picture Puzzles (find the “lost” objects!). This entry was posted in Story Boxes and tagged craft, lost, preschool, storybox, storytime, toddlers by jeninthelibrary. Bookmark the permalink.